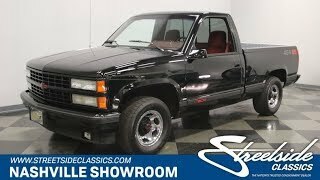 Hi, I am interested in your 1990 Chevrolet Silverado 1500 2WD Regular Cab 454 SS (stock #1270-NSH) listed on Autotrader for $31,995. I'd like to get more information about this vehicle and confirm its availability. Factory performance trucks werent really a thing until this one came along. It wasnt hard to do. Drop a motor with monster amounts of torque into the smallest, lightest, full-sized pickup you have, beef up the suspension and drivetrain a bit so it handled more like a sportscar than a pickup, and voila! Tire smoking factory fun. This one has led a sheltered life, venturing out for less than 14,000 miles over the last almost 30 years. Check out this ground breaking time capsule of a truck. The design team at Chevy made the choice to keep the look of this truck clean and simple, although maybe menacing would be a better description with its Black Onyx paint. Also lending to the intimidation factor is an SS designation that appeared for the first time ever on a pickup. Although this brute could obviously be used as a work truck, it was not. It appears to have spent its life indoors or at least under cover because the factory original paint is in excellent shape. A black grill underlined by a black bumper adds to the subtle, understated look with just a red bowtie in the center and a set of fog lights mounted down low in the chin spoiler. The window trim is blacked out as are the side mirrors. 454 SS appears on the sides of the bed and Chevrolet in script with another bowtie is lettered on the tailgate. The bed itself is nicely dressed out in diamond plate along with a rubber mat. Open the door and you will find a Garnet Red cloth interior which, as you would expect with such low mileage, has little to no wear on anything and it is all completely stock. Diamond plate protects the door sills and the whole interior looks showroom fresh from top to bottom. The door panel has a nice armrest with the power window and lock switches at your fingertips. Have a seat in the high back reclining buckets. They are both super comfortable for cruising and also have nice side bolsters to offer support if you decide to cut this truck loose and have some fun. The 4-spoke steering wheel is mounted on a tilt column along with the cruise control stalk and the shifter for the automatic transmission. The dash and gauges are spotless and the FM/cassette deck has a built-in equalizer. Red vinyl floormats protect the carpets and there is a big center console with cup holders between the seats. Pop the hood and you will find that torquey big-block 454 motor nestled down in a neat and clean engine bay. It is all completely stock and is the original, numbers matching engine. There is nothing flashy about this engine. No chrome, no aftermarket dress-up pieces. Just tons of torque to get the job done. A dual exhaust system winds its way back and ends with dual chrome exhaust tips that peek out from under the back bumper. Power is sent back through a Turbo Hydra-Matic 400 3-speed transmission to a heavy-duty rear end which was outfitted with 3.73 gears and had semi-floating axles to transmit all that power effectively. The factory also upgraded the suspension with Bilstein gas shocks and a beefy sway bar up front that really help this truck handle well. The rubber meets the road through polished factory 5-lug wheels which look great and mount 275/60R15 BFGoodrich Comp T/A radials. This is an opportunity to own a super low mileage, time capsule truck, and the first one to ever wear an SS badge. Come on down, check it out, and drive it on home.